BBC research has found at least 577 UK supermarkets were approved in the past two years, with campaigners concerned at the growth of the 'big four' stores. Planning authorities gave Tesco, Sainsbury's, Asda and Morrisons permission for at least 480 stores in England in the two years to 1 November. Campaigners say the stores are putting independent traders out of business. But the supermarkets say they provide thousands of jobs, and are supported by their customers. In Scotland, at least 67 stores were approved: 22 in Wales and at least eight in Northern Ireland, researchers found. The supermarkets insist they carefully consider where they build new superstores and convenience shops, adding that their developments create jobs and help regenerate towns and cities. Despite the number of stores approved, the British Retail Consortium (BRC), which represents the big four, said the current rate of growth was lower than that seen earlier in the decade, and was driven by customers, not corporate greed. And the Usdaw union, which represents many supermarket employees, said the companies were providing crucial jobs during tough economic times. But the Farmers for Action (FFA) campaign group said it feared competitive discounting and the way supermarkets traded with food producers would eventually "put British agriculture out of business". Meanwhile campaigner Jessie Miller, who is fighting plans for a new supermarket in Oswestry, Shropshire, said the increase in stores was "bad for the character of our country" because it left High Streets unable to compete. Others have criticised the UK's planning laws, alleging supermarkets are able to exploit them for their own gain, without consulting local communities. John Walker, national chairman for the Federation of Small Businesses, said the number of stores which had opened in the UK in two years was "a concern", especially when almost 12,000 independent shops closed their doors in 2009. However he added that in some areas supermarkets could give towns a boost, attracting more people to the area that may then also use high street shops. In order to gauge the rate of expansion of the major supermarkets, the BBC contacted planning authorities across the UK to find out how many new stores had been approved between 1 November 2008 and 1 November 2010. Not all councils responded, but out of those that did Tesco proved to have had the most successful applications with at least 392 stores (large stores and smaller convenience shops) approved, followed by Sainsbury's at 111, Morrisons with 41 and Asda at 33. In England, London had the highest number of proposed new supermarkets with 110, followed by the North West with 63. A BBC Panorama special programme called Supermarkets: What price cheap food? will be broadcast on BBC One at 2100 GMT on Wednesday and will also investigate the growth of supermarkets. Chef and food campaigner Hugh Fearnley-Whittingstall told the programme: "Such is the power of the supermarkets, they are effectively rearranging the entire landscape to suit their business practices. "You don't need to explain the attraction of cheap food, everybody likes saving money, but the effect of that simple drive to bring down price - it's massively altering the way we produce food, the scale on which we produce food." FFA chairman David Handley said the British agricultural industry had been in decline for the past 10 years, which he said was down to the low prices supermarkets paid to farmers and the way they traded with them. He said: "They need to be looking at the way they trade, the way they will continue to trade as they get bigger and bigger. "If they continue the way they are trading at the moment they are going to put British agriculture out of business," he said. The BRC said supermarket growth had actually been modest and consistent over the years. Spokesman Richard Dodd said: "Anyone who is saying supermarkets are actually growing more rapidly than ever is actually wrong. "Why is supermarket floor space growing at all? The answer is all of this is driven by customers. The people who have the power in retailing are the customers." Tesco alone says it has 20m customers a week. Campaign group Oswestry 21 has been fighting against a new supermarket in Oswestry for the past two years. Ms Miller, the group's secretary, said she was concerned that supermarkets were "just filling in their map" and not caring about what towns needed or wanted. "We are seeing more and more supermarkets and the High Street just cannot compete," she said. Responding to the BBC's research, Tesco said in a statement: "The BBC figures are incomplete and misleading. 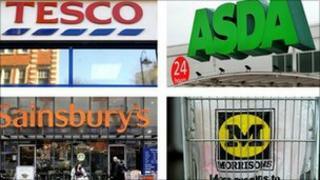 A Morrisons spokesperson said: "Morrisons is different from other supermarkets. We are the only one to own much of our own supply chain including meat processing and produce packing. "However, there are still many parts of the country where we are under-represented. So an important part of our business plan is to provide Morrisons food for more communities across Britain." Asda said that of the big four it had "far fewer stores than anyone else" but it added in terms of sales it was still the second largest. It said: "Because some parts of the country are dominated by others, we tend to find communities love the idea of an Asda to give them real choice with the lowest prices and ranges such as George." And Sainsbury's said: "Sainsbury's current expansion plans are based on sound commercial judgements about what is best for our business and our customers in the next five years. "We take great care to identify the right opportunities to build new stores and extend existing ones. "Most of our new stores (75%) are being built in areas where we are currently under-represented like the north-west of England and Scotland, for example. "We will have created 13,000 new jobs around the country in two years by March 2011." BBC Panorama's Supermarkets: What price cheap food? will air on BBC One at 2100 GMT and will be available on BBC iPlayer. Future of farming: Mega-dairy or theme park?